!discord !setlist !gender Been a little while since I streamed clone hero, let's change that! Hey, guys! I'm Michael3D. I enjoy playing games, especially fast paced action team shooters. I have traveled the world competing professionally in several FPS games since 2005, and my teams have won tournaments in at least 15 different games. Howdy! My name is James and I play Rocksmith. Drop in and request some metal for me to sightread! Also, check out my YouTube for some fun play-throughs! My name is Seth Sanchez, aka "happyf333tz". I stream Pump It Up & In The Groove, both are dance games that are very similar to Dance Dance Revolution. I have over 20 years of experience playing these games and also hold multiple World Records on both games. My goal on Twitch is to help these games grow in popularity and entertain others through the power of music. I'm Aren, that one human that streams Clone Hero with the neat LEDs. Oh and sometimes I do charting livestreams as well. Thanks for popping by, I hope you have a great time! My name is Alan, I am 23 years old, my girlfriend, Livia, is 19 and we currently live in switzerland. Yea i know its a "beautiful" Country.. but expensive as hell. My Goal? Being a Full Time streamer for you guys! Because you are awesome! Who are you? : Ben aka Grabapint or Pint! I chose the name as I am a fan of craft beer. Likes: Music, Video games, Concrete smell right after it rains. Dislikes: Buffering, Bots not working, and People being jerks :D I play guitar and bass. Not great, but I enjoy playing. I'm a 21 year old British man who loves playing videogames and also enjoys entertaining people, so i figured a twitch stream would be a fantastic way to combine these two interests of mine. What's up guys, I'm Jake! 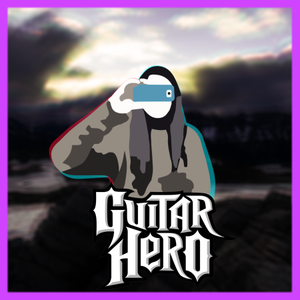 I'm a super chill and funny dude who shreds pretty hard on Clone Hero, and will soon be expanding my streams to my Xbox One games (if I haven't already). My viewers are always easily entertained and chill, so feel free to drop in and see for yourself. Hope to see you soon! My name is Derrick, I'm 35. I spend my weeks working a 9 hour a day job only to come home and play games. I also love playing the guitar, though I'm still well in the learning phase. Favorite games right now are Rocksmith, PUBG, World of Warcraft and various VR games. Hey guys, I'm Alex! I play a ton of games but mainly Borderlands 2 and Clone Hero! They call me The Hoff. I play Guitar, I play vidya, and I play guitar vidya! If you ask nicely, I might put on a cowboy hat. Ordnary...without the 'i" cuz "i" am not Ordinary... ha ha ha... I'll stop. I mainly stream Guitar Hero 3 but without the guitar cuz I can. I also stream Rocket League and been thinking of other games to stream as well. I have been a guitar hero player for years, now I am having a blast with Clone Hero! I also develop things from time to time. I have a pet snek, I also have a pet rubber ducky called debug duck who helps me when i'm doing the dev on work systems.